Flamin' Sharp are pleased to introduce to the market our own brand and range of ‘Mirror Cut Pro' quality scissor at very affordable prices. Our ‘Salon Select' series are manufactured from Japanese 420 J2 Surgical Stainless Steel and the ‘Artisan' high end scissor from Japanese 440C Stainless Steel. 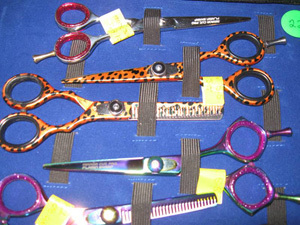 ‘Salon Select' series J2 Scissor (All Styles) $180.00 plus GST. 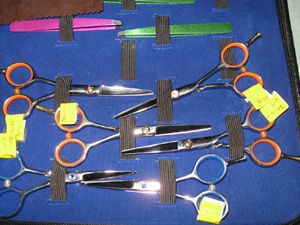 ‘Artisan' series 440C Scissor (All Styles) $240.00 plus GST. We can offer discounts for multiple purchases. 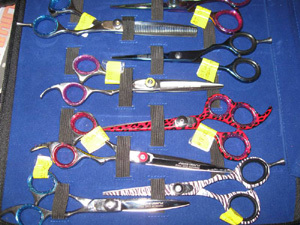 Our prices can be up to 2/3 cheaper than similar quality scissors because we deal Direct with the manufacturer and can cut out 2 or 3 levels of middle men from the traditional supply chain and supply Direct to you, the end user. We also have access to Manufacturers ‘Over Runs', Cancelled Orders and for want of a better word, ‘Scratch n Dent' scissors from time to time. 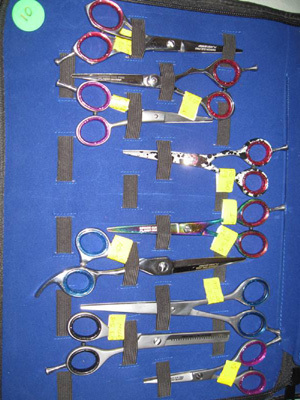 We can Sharpen and Repair your scissors on site with our Mobile Sharpening Unit and leave you with a set or ‘Loan Scissors' while we are servicing yours. 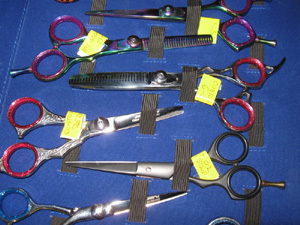 Prices range between $55 and $77 depending on the type of scissor. Our workmanship is fully guaranteed. For each $50.00 worth of work we receive, be it scissor sharpening or knives and gardening equipment from home, yours, family or friends, Flamin' Sharp will mark off a 10% square on your $harp n $ave Loyalty Rewards Card and upon the 10th box being marked, you can choose absolutely free of charge 1 scissor from our ‘Salon Select' range of scissor valued at $200.00 RRP. Click here for more information.